Zero Install does not install applications in the classic sense. Instead, applications (along with any additional libraries they may require) are downloaded and extracted in an isolated cache directory. Applications have no say in where they get extracted and cannot change any settings or shortcuts during installation. This means adding and updating applications has no side effects. You can always undo any changes you make, there are never any library conflicts and you can even keep multiple versions of a single application. 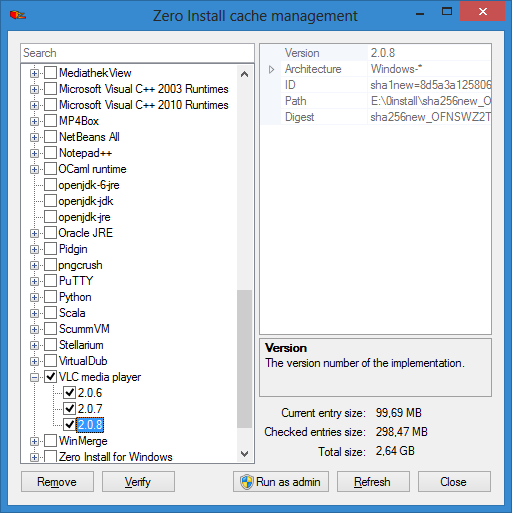 Zero Install will only remove applications from the cache when you tell it to. Therefore, applications you have downloaded stay available even when you are offline. Zero Install allows you to control exactly how an application is integrated into your desktop environment (start menu, file type associations, context menus, etc.). It provides sensible and unobtrusive defaults if you do not want to fiddle with the details.